You'll be £6.00 closer to your next £10.00 credit when you purchase Tracing History Through Title Deeds. What's this? Property title deeds are perhaps the most numerous sources of historical evidence but also one of the most neglected. While the information any one deed contains can often be reduced to a few lines, it can be of critical importance for family and local historians. Nat Alcock's handbook aims to help the growing army of enthusiastic researchers to use the evidence of these documents, without burying them in legal technicalities. It also reveals how fascinating and rewarding they can be once their history, language and purpose are understood. A sequence of concise, accessible chapters explains why they are so useful, where they can be found and how the evidence they provide can be extracted and applied. Family historians will find they reveal family, social and financial relationships and local historians can discover from them so much about land ownership, field and place names, the history of buildings and the expansion of towns and cities. They also bring our ancestors into view in the fullness of life, not just at birth, marriage and death, and provide more rounded pictures of the members of a family tree. This is a book which is highly recommended for those local and family historians new to exploring dusty old title deeds, but it comes with a health warning. Online reviews have said it is ‘excellent’, ‘invaluable’, and ‘essential’, and a fourth reviewer described it as ‘my ‘’bible’’ when it came to trying to understand and interpret title deeds’ - all are very apt descriptions of what is one of the few books in print on this subject. After the introduction, there are just three chapters, entitled ‘Why?’, ‘Where?’ and ‘How?’, which are shorthand for ‘Why use deeds and what do they contain?’, ‘Where are they located?’ and ‘How can their evidence be extracted’. In addition, at the end of the book are two useful indices plus a glossary and several appendices. It’s not a difficult read, there are detailed notes at the end of each chapter, and there is no question that this is an informative well-written book by someone who clearly knows his subject, so what’s not to like? With enthusiasm the author presents the case for the usefulness of these documents. He informs us where to find the deeds and how to extract information. It is an excellent and very accessible reference book enhanced by many useful and interesting examples illustrating the nature and the value of deeds to family historians who desire to learn more of the lives of their early ancestors. A fascinating book for both family and local historians. Nat Alcock openly presents this book as a repackaging of his earlier work ‘Old Title Deeds’ but, importantly, updated to reflect what he describes as ‘an explosion in the use of personal computers, laptops and tablets, and of digital photography.’ This volume also preserves the structural simplicity of its predecessor, an introductory chapter followed by three core sections based on half of Kipling’s ‘six honest serving men’ – why, where and how? On this basis, it may be tempting to conclude that the re-styled content has little new to offer. However, this judgement would fail to recognise the effort made to modernise the presentation style and enliven the text. The researcher is also offered a wealth of additional practical advice; for example, how to obtain details of documents submitted on first registration and how to use The National Archives’ online catalogue, Discovery, and other overarching databases, to best advantage. Further valuable help is also found in more expansive appendices offering flowcharts to help identify deed types and texts of typical deeds. The reality remains that, for many family historians, the effort required to first locate and then extract what might prove to be minimal information from a bundle of near illegible old deeds, does not represent a worthwhile investment in time. However, for those undaunted by the potential challenge, Nat Alcock’s latest publication may help pave the way to significant discoveries. An essential guide to a much-neglected source, vital for house historians. 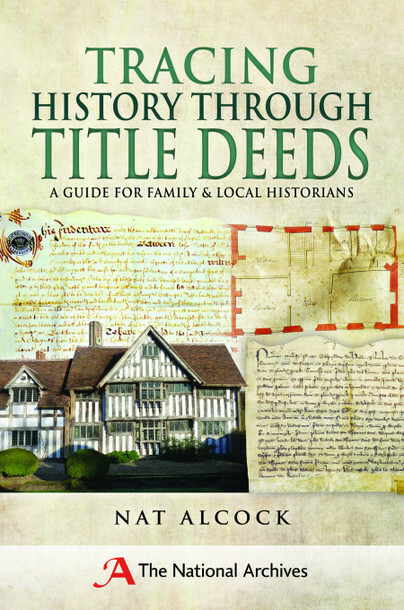 The book helpfully explores the subject in terms of the why, where and how of title deeds. Read it for:An essential expert guide to these complex legal documents. Although a major source of information about field and place names, property history and the growth of towns and cities, these documents are some of the most neglected. Useful reading for beginner and experienced family and local historians, Dr Nat Alcock, of the University of Warwick, aims to put this right by demonstrating how these records can be found, analysed and interpreted. With information presented in a series of concise and easy-to-read chapters, it reveals how fascinating and rewarding title deeds can be once their history, language and purpose are understood. Dr Nat Alcock is an emeritus reader at the University of Warwick. He has worked for many years recording vernacular buildings, compiling house histories and reconstructing households and lifestyles. Among his publications are Documenting the History of Houses and People at Home. He is a Fellow of the Society of Antiquaries and a past President of the Vernacular Architecture Group.